Questions about the security of and control over customer data, and where it resides, are on the minds of cloud customers today. 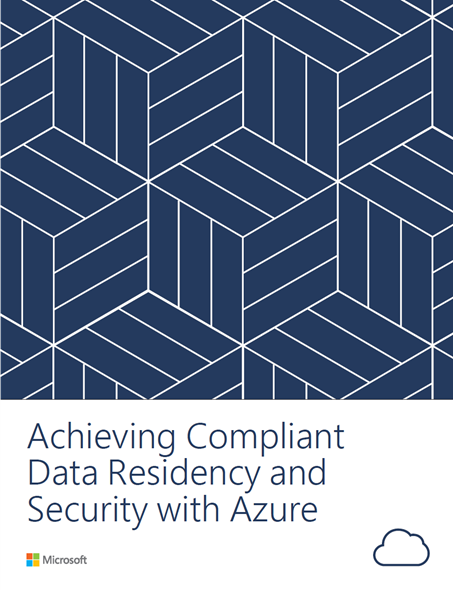 We’re hearing you, and in response, we published a whitepaper that gives clear answers and guidance into the security, data residency, data flows, and compliance aspects of Microsoft Azure. The paper is designed to help our customers ensure that their customer data on Azure is handled in a way that meets their data protection, regulatory, and sovereignty requirements. Transparency and control are essential to establishing and maintaining trust in cloud technology, while restricted and regulated industries have additional requirements for risk management and to ensure ongoing compliance. To address this, Microsoft provides an industry-leading security and compliance portfolio. Security is built into the Azure platform beginning with the development process, which is conducted in accordance with the Security Development Lifecycle (SDL). Azure also includes technologies, controls, and tools that address data management and governance, such as Active Directory identity and access controls, network and infrastructure security technologies and tools, threat protection, and encryption to protect data in transit and at rest. Microsoft gives customers options so they can control the types of data and locations where customer data is stored on Azure. With the innovation of the security and compliance frameworks, customers in regulated industries can confidently run mission-critical workloads in the cloud and leverage all the advantages of Microsoft’s hyperscale cloud. Learn more and get a list of Microsoft‘s compliance offerings on the Microsoft Trust Center site.